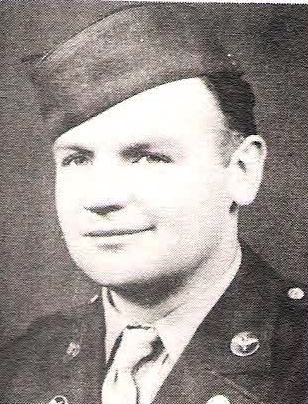 T/Sgt Delbert D. Kendall, son of Mr. and Mrs. J. M. Kendall, Graham, graduate of Graham High. Entered AAF, 1941, trained at Ft. Bliss, Tex., Cal. Utah, Del., Ind. and Chanute Field, Ill. Served in England, Italy, France, Belgium and German. Awarded GCM, Air Medal, ETO Ribbon with 9Battle Stars, Pres. Cit, AD and ATO. Discharged in 1945. Killed in Auto Accident May 9, 1946.